Jewish Art Salon: Brooklyn's Sephardic Community Center's new Artist Showcase program. 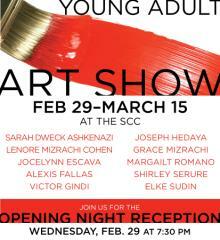 Brooklyn's Sephardic Community Center's new Artist Showcase program. The Sephardic Community Center will be hosting group and solo shows featuring the talented painters, photographers and designers of its community throughout the year. The first group show and opening reception: Wednesday February 29th, 7:30 PM. Work by Sarah Ashkenazi, Lenore Cohen, Jocelynn Escava, Suzy Fallas, Victor Gindi, Joseph Hedaya, Grace Mizrachi, Margalit Romano, Shirley Serure and Elke Reva Sudin.